Sudbury Crater is the eroded remains of a giant, 1.85-billion-year-old impact crater in Ontario, Canada. 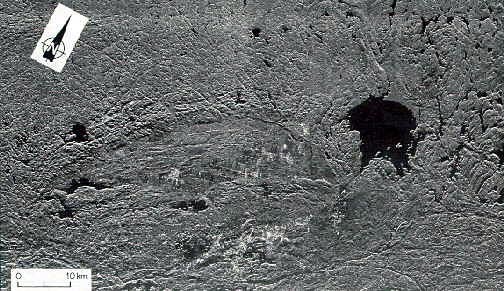 The Sudbury Crater, at almost 200 kilometers across, is roughly the size of the much younger Chicxulub Basin. But whereas the latter is believed to have been caused by an asteroid that killed the dinosaurs, along with many other life forms at the K-T boundary, it appears that the Sudbury Crater was formed by a comet. Scientists have reached this conclusion by comparing the mass of the impact melt at the two sites: 18,000 cubic kilometers at Chicxulub and 31,000 cubic kilometers at Sudbury.